Troja. Thermopylae. Marathon. Plataea. Mantinea. Leuctra. Route of Xenophon and the Ten Thousand Greeks. Granicus. Issus. Arbela. Thracian Bosporus. Alexandria. This is a fascinating 1867 map by William Hughes featuring topographical maps of ancient cities and battle sites. The map essentially contains twelve maps on a single sheet, each focusing on a different city or town, where important ancient battles took place. 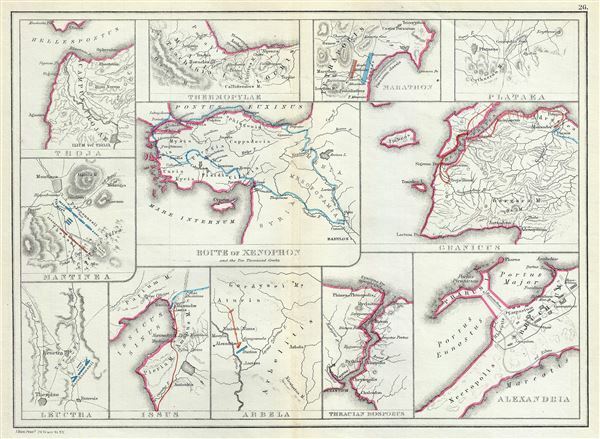 Beginning from the map on the top left, moving clockwise, these include Troy (Troja), Thermopylae, Marathon, Plataea, Granicus, Alexandria, Thracian Bosporus, Erbil (Arbela), Issus, Leuctra and Mantinea. Some of the maps are color coded to show the two sides in battle. The map in the center features the Route of Xenophon and the Ten Thousand Greeks. From 401 BC and 399 BC, a group of ten thousand Greek mercenaries marched to the battle of Cunaxa (Connaxa). The mercenaries, brought together by Cyrus the Younger, hoped to unseat the Persian king Artaxerxes II in favor of Cyrus. The Greeks marched from the Aegean coast inland as far as Mesopotamia where the forces of Artaxerxes II were crushed. The military victory however, proved pointless as Cyrus himself had been slain. Xenophon, one of their leaders, recorded the expedition in his book Anabasis, which would later be used by Alexander the Great during his early missions into Persia. The map on the top left features Troy, the ancient city located in northwest Turkey, most famous for being the location of the Trojan War between the Archaeans and the city of Troy. Homer's Illiad and Odyssey describe the events of the War. Thermopylae, featured in the next map, was an ancient region in Greece known for the Battle of Thermopylae during the second Persian invasion of Greece. It was fought by an alliance of the Greek city-states, against the Persian Empire of Xerxes I. Marathon, featured in the next map, was witness to the Battle of Marathon in 490 BC, between the Athenians and Persian forces resulting in an Athenian victory. Plataea is features in the map on the top right quadrant of the map. The battle of Plataea occurred here in 479 BC and was the last battle in the second Persian invasion of Greece. It was fought by an alliance of the Greek city-states, including Sparta, Athens, Corinth and Megara, against the Persian Empire of Xerxes I. The battle concluded with a large portion of the Persian army trapped in their camp where they were slaughtered, essentially brining the invasion to a close. The map of Granicus below it depicts the movements of Alexander the Great and the Persian Empire during the Battle of Granicus River. Fought on the road from Abydos (noted here) near the Granicus River, on whose banks Alexander the Great gained his first victory over Darius, thus gaining a huge portion of Asia Minor. The map of Alexandria, featured in the lower right quadrant is highly detailed and notes important ancient buildings, including the gymnasium, the amphitheater, etc. Alexandria, founded by Alexander the Great on his way back from the Oasis and Temple of Jupiter Ammon, was one of the most important ancient cities. The Thracian Bosporus features in the next map, depicts the Bosphorus, a narrow naval passage from the Sea of Marmara to the Black Sea, The ancient city of Byzantium (modern day Istanbul) is also identified. Arbela, or modern day Erbil or Irbil, depicted in the next map, was the scene of the battle between Alexander the Great and Darius III of Persia, which sealed the fate of Darius and the Persian monarchy. The map of Issus depicts the scene of the battle of Issus, where Alexander gained his second victory over the Persians, and made prisoners of war the wife, mother, and infant son of Darius. The map on the bottom left features Leuctra, a village in Boeotia. This map details the battle of Leuctra, fought in BC 371 between the Boeotians and the Spartans, part of the post-Peloponnesian War conflicts. It was during this battle that Epaminondas, commander of the Boeotian League, gained his first victory over the Lacedaemonians. The map of Mantinea depicts the scene of battle between the Thebans and the Spartans in 362 BC. The battle resulted in the second great victory of the Theban Epaminondas over the Lacedaemonians, and also the death of Epaminondas. The death of the victorious leader and the defeat of the Spartans led to the weakening of both the Spartans and the Thebans and eventually the rise of Macedonians in Greece. This map was created by William Hughes, printed by J. Bien and engraved by G.E. Sherman, for issued as plate 26 in Sheldon and Company's An Atlas of Classical Geography.